The charming property features a former 19th century coach house with exposed oak beams, a large sitting room with high ceilings and a large writing desk. French Windows lead out to a private patio and guests also have access to the historic gardens and grounds of Upton Cressett. 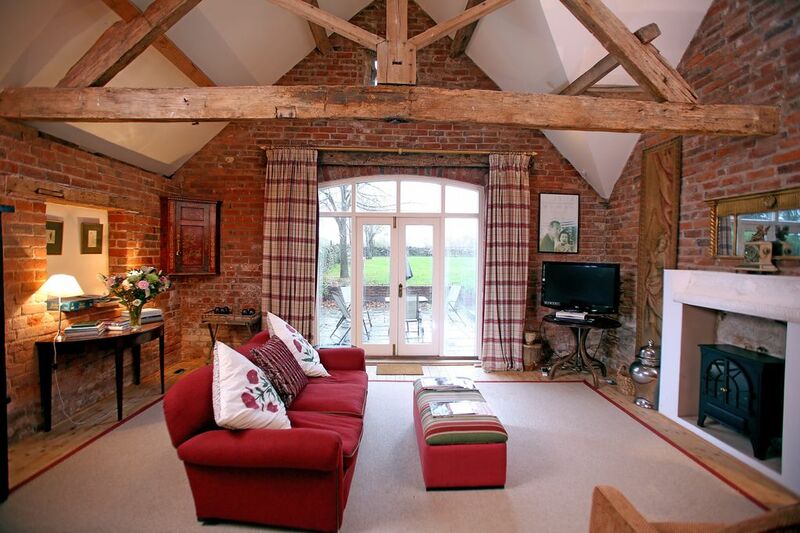 The kitchen and dinning area is open plan with high celings and oak beams. It is located adjacent to The Gatehouse, winner of Best Hidden Gem at the Hudson’s Heritage Awards. The Coach House accommodates four guests. 2 double bedrooms, 2 bathrooms. All linen and towels provided. The White Co. bathroom products. Electric cooker, microwave, American fridge/freezer, washing machine/tumble dryer. Sky Television. WiFi internet access. Private south facing patio – perfect for outdoor dining. An outdoor table and BBQ. Access to the historic gardens of Upton Cressett. No stairs – the property is ground floor only. The Coach House can be taken in conjunction with The Gatehouse to provide accommodation for eight guests. With out door furniture, including a table chairs and sun lounger. Located in the peaceful Shropshire countryside the two-bedroom accommodation offered two couples well appointed, ample space and country hospitality. Our hosts greeted us upon a late arrival, answered questions and were generous with their time, providing valuable insight about the area and the property history. We especially enjoyed walking the grounds through the garden, chapel and graveyard. The Saturday market in Bridgnorth, a ten-minute drive way, was also a treat. We highly recommend this vacation rental and will return. We had a very enjoyable weekend in the coach house and would definitely return. It is very cosy and is exactly as it looks in the pictures. There is everything you could want and in a lovely part of the country. As a bonus the beds are amazingly comfortable. Wow, what a find. The location was great, out in the country, but close to town and the market place. Laura greeted us, upon arrival, and was helpful and accommodating. We were quite comfortable, had everything we needed and loved our stay. A lovely cottage, comfortable beds, lovely linen and towels lots of little extras provided, perfect weekend break with friends. Our only negative would be that the cleaning could be better far too many cobwebs and hadn't been dusted. The accommodation was all we could ask for. Beautiful house in a quite location. The area has many interesting places to visit. The house itself is at the end of a long lane but is in a wonderful location. The young lady who received us was exceptionally helpful in all ways. We had a welcome pack on arrival, this was very thoughtful.Would recommend the property to both families and individuals. A travel cot for infants can be provided at no extra cost. An extra children’s bed can be provided in any of the bedrooms at a cost of £25 per stay. High chairs are provided free of charge. Please let us know in advance if you require any of these so we can have it prepared for your arrival. N.B There should not be more than 2 adults per room. Your property at Upton Cressett will be available from 4pm on the day of arrival until 10am on the day of departure. If you would like to arrive earlier please contact us. We do ask that you get in touch by telephone or email a few days in advance to provide your approximate arrival time. 01746714616 A non-refundable deposit of 50% of the total cost of the booking is required - within 3 working days of the booking being confirmed by Upton Cressett - and if more than 4 weeks before the start of your stay. Full payment is required at the time of reservation if your booking is made less than 1 calendar month prior to the start of your stay. a) More than 4 weeks notice is given prior to the start date of the holiday, then only the loss of the deposit will occur. b) Less than 2 weeks notice is given prior to the start date of the holiday then we reserve the right to charge the full amount. We will endeavour to re-let the accommodation on your behalf and, if successful, we will refund the deposit/full payment as applicable minus a £50.00 cancellation fee to cover our administrative cost.